Steel Drum Pans: Where can YOU see a band like this in Calgary? Check out the steel drum pans. Ever have heard the steel drum pans in Calgary? Check this unique and fun band, the Calysto Steel Band. 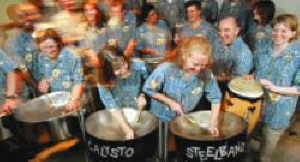 One of Calgary's most unusual entertainment outfits is the Calysto Steelband. Here you would have found a supersize combo of musicians performing on the traditional steel drums of the Caribbean Sea and its island nations. Until late 2010, this outfit performed mostly at privately arranged engagements. Sometimes we played public Calgary music venues such as neighbourhood pubs around the city of Calgary. See schedule and maps below. Calysto Steelband has travelled to Barbados on several occasions to play in local venues. Places such as the Holetown musical festival and Barbados beach front restaurants. The bands that play steel drum pans form a great part of Barbados nightlife. I have personally been overwhelmed by the quality of the entertainment in this part of the world. Have a look at some steel drum pictures. The band was great fun playing reggae music, well known and ethnic tunes. The fun included soca, latin, rock n roll and calypso all from one steel band. You could also enjoy some Bossa Nova and other tropical styles. If you had a chance to see this band live, you would not have been disappointed in the quality of the performance. They occasionally played public performances as well. or maybe you would rather Calysto on Facebook. Where are the bands around Calgary? Calgary Rocks! Or does it? Know of any other great bands in town? Country? Metal? Alternative? Your Band? Maybe someone else wants to know. Let us know. Most bands need whatever help they can get. Help yourself now and include a photo if you wish. Maybe you can even find a good band to join here. Good Luck. Here's where you give us the goods on the band. Go ahead...Make my day. Do you have a picture to add? Press on the PANoramic graphic below. Where has Calysto played in the past years? To join the band, have a look at this page. Curious about how the instruments work? Now for some technical information about our pans. Now that you know our schedule and availability, find out more about the band. Find out where my rock band is playing! Back in the Day is going strong. Go back from Steel Drum Pans to the Calgary City Maps homepage.